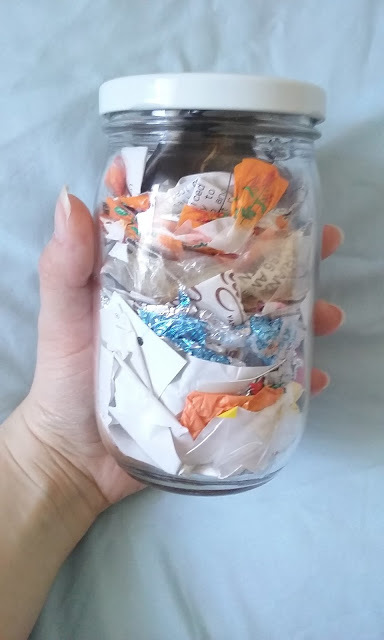 This is just some of the trash I've made the past year. I'll be honest, I couldn't fit all of it in one jar, but that's okay. Zero waste isn't about being perfect: You have to start somewhere. Do I need it? You might be surprised at how much stuff you buy you don't actually need. Ex: Paper towels, which can easily be replaced with reusable tea towels. Can I find a reusable alternative? Most items have a reusable alternative, you just have to do a little digging. 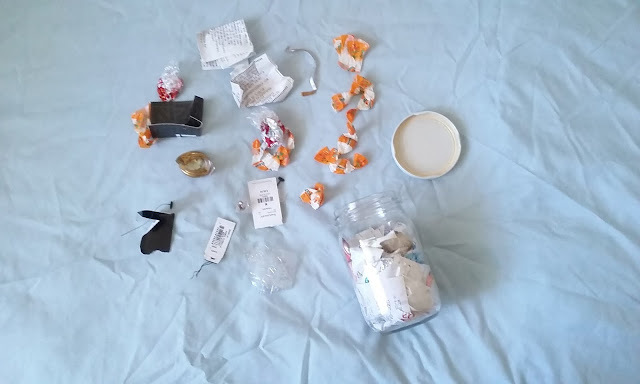 Every disposable item you can imagine (disposable razors, tissues, toothbrushes, etc.) has a sustainable cousin somewhere out there. Can I make it? Some items can be made zero waste through a little DIY action. For example, most condiments (which usually come in plastic) can be made at home and stored in glass containers. Everything from toothpaste to almond milk can be made at home, you just have to get a little crafty. Is it available in bulk? Bulk food shopping is a zero waster's best friend: Many grocery stores now offer food in dispensers, which mean you can take your own bags or jars and fill them up with items you want. No packaging needed! Find bulk food stores near you with this handy app. A quick analysis of the trash pictured above: I'm definitely guilty of eating lots of Ricola cough drops (when sick). One of the biggest transitions for me has been using reusable bags and produce bags at the farmers market! Once you've analyzed your trash, you'll be able to see what it is you need to work on most. Maybe you use too many napkins or plastic straws. Maybe you go shopping a lot and have too many price tags or beauty product containers. Whatever waste you're creating, get to the bottom of it and brain storm some ways to transition out of it. You might feel the urge to completely purge yourself of all plastic and all paper products (especially single-use ones) but don't. That would be just as wasteful. I suggest using what you have and replacing it with a better, more sustainable option when its outlived its usefulness. So for example: Lets say you just bought napkins - Don't dump them in the trash just because you discovered the zero waste movement. Use them up and while you're using them, take the time to research zero waste alternatives to napkins (ex: cloth napkins). Purchase (or make some) while you're finishing up your disposables so you'll be covered when they run out. This is just one example, but you get the idea. Try to slowly phase things out of your life so you don't drive yourself crazy (or go bankrupt). Use this as an opportunity to de-clutter your life. Take things slow and steady so you don't get overwhelmed. Go through all your items and ask yourself if you truly need it, use it or want it. If the answer is yes, you use it, keep it. If not, donate the item to those in need, a friend, or a loved one. Save and invest money in durable, sustainable alternatives when the time is right. Use what you have (ex: plastic Tupperware), then replace it with a more sustainable alternative (mason jars, stainless steel air-tight containers, etc.) when it's past prime. Go for durable items made out of glass, wood, cloth, or stainless steel. Make sure they're easy to recycle or compost and can be used several times. If an item is out of budget right now, save up for it and invest when the time is right (chances are it will actually wind up saving you money in the long run). Find stores near you that sell sustainable products. You might be surprised at what your local supermarket, thrift store and health food store has to offer. Sometimes, even conventional, big name brand stores sell sustainable items: Personally, I find a lot of zero waste household items at Home Goods - you just have to look for them. Set a time limit to see how long it takes you to use an item. Generally speaking, if I use an item less than 5 times over a 6 month period, it's not worth keeping. Donate, re-gift or sell it. Learn the fine art of saying "no" to single-use plastic. It takes guts. Learn how to mend, fix and repair your items: You want your them to last a long time, rather than replacing them. Learning how to sew, or taking your clothes/shoes to a tailor is a great idea. Create a simple zero waste kit to begin your journey. When I first started this journey, one of my biggest sources of waste stemmed from being out and about. By creating a zero waste kit, I was able to forego a lot of waste. Here are my 5 zero waste travel essentials (though I've added to it since writing this post!) My kit is a bit more expensive because I invested in products from eco-friendly brands I trust. However, you could probably thrift a lot of the products I mentioned in mine, or even DIY some of them. 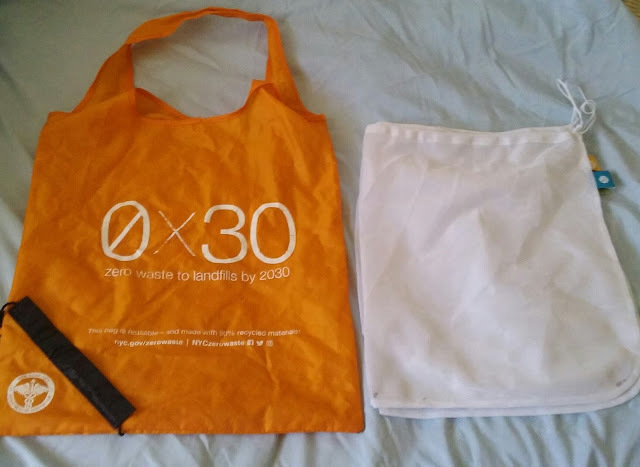 Need more help transitioning into zero waste living? Check out my zero waste resources page! I've included several articles perfect for beginners. You can also check out my zero waste pages for more specific information. I've recently created a bunch of zero waste categories such as kitchen, cleaning, holidays, bathroom, and more. You can view any of these pages by checking out my main menu (they're under the zero waste tab). If you'd rather just stick to the basics, my zero waste resources page is the place to start!